FairtradeForum India (FTF-I) is a national network of members who confer and promote the Fairtrade principles in India. FTFI Members include organizations and individuals. We were approached to build a brand for a wide range of products spanning from foods, spices, handicrafts to garments -a trading face and retail initiative for FTFI. A retail activity that would introduce the idea of fair-trade to the Indian customer and be used for promotion of products & services of FairTrade in India. The activity to make use of existing floor space of the members stores in rolling out the retail activity. A retail activity that would endorse and bring all the network members together under a shared vision and serve as a canopy to unite them. Fairtrade is a global movement, its activities and context have been built specific to places and its people. 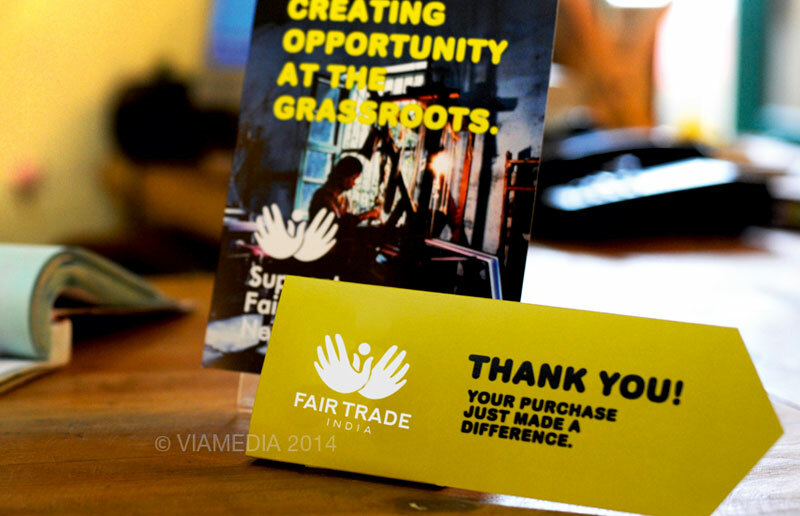 The opportunity for Fairtrade in India has been unexplored. The activity had to begin with establishing the context of fair-trade in India. The focus of the activity would be to build awareness of FTI. To introduce the network and the core idea of Fairtrade India. Build an emotional engagement with the cause and in turn its products, initiate the audience to action(buy). - Autonomy: Individual Member stores to showcase a 60-40 mix, of their products and fairtrade member products respectively. Each member has the flexibility to choose fair-trade member dynamic product mix based on the demands of his local market. - Localization: It is a portal of local economy with a mandate for social empowerment. Autonomy in management of every store and product mix, offers customers a wide range of experiences across fair-trade stores in the country. - Flexibility: An opportunity to rethink use of existing space - member stores, and for every member products to sit in that many more stores. - Value: Offering members a product portfolio as large as the network combined. - Diversity: The network is rich in diversity of products right from food products to garments to handicrafts. What is most promising about design thinking is that it creates new ideas that provide choices for business and society through a bottom-up emergent approach. Here existing resources, producers, real estate were being leveraged through the member network in building the brand. A flat flexible organizational model which encourages individual initiative, independence and risk taking; and at the same time an open ended system that will have to grow on information processing and feedback; that thrives on collective intelligence. Bringing in a new flexibility in retail. This approach however would be complex, emergent, and the strength of the model would lie in it's management. Here design addresses issues beyond monetary benefits but also those of quality, sustainability, etc. A sensitivity towards long term benefit assures appraised brand value beyond just revenues and sales. Unlike most brands that need to build a sellable and aspiring story, fair-trade is a true-life story, a story from the grassroots, a story that is as it is. These stories are real and the ones that make the honey sweeter, the clothes cleaner and the handicraft gifts that much more thoughtful. The product demands design and communication that is just as authentic and true to the product being offered. Here the customer is buying into something larger than the product; he is buying into the philosophy and spirit of the brand “fairtrade”. The values remain constant across all the member stores. A set of collateral was built to showcase the size of the network along with customizable communication that would focus on the products that vary from store-to-store, from seasons to regions. Products are from across the network and produced by the members of the FTF-I conferring to Fairtrade guidelines. Communication was kept as expressive in telling stories from across the member network. Touchpoints were designed to trigger dialogue and meaningful interaction. Fairtrade is perfect example of how brands are being driven less by mere styling, and more towards the growing need to demonstrate greater meaning and purpose. It is in these ways that design is has tremendous value and potential to move us forward not beyond just monetary benefit, but also with 'change'. Here resources are not as intrinsically strategic; as when when they are combined and, integrated and co-ordinated in the context of the activity, giving lasting competitive advantage. And it is in these ways that we build brands that matter. Brands ought to believe in their responsibility of taking the world forward, not just for the benefit of the economy but in making a difference, in unleashing the greater purpose and meaning to life. Brands hold in their capacity the power to influence and add value through their mediums of message, object and space. Brands are more than a name. In an image driven world, it is becoming , more and more critical, how you look, what you stand for. Fortunately or unfortunately we live in times where the name and look of the product appeal just as much as the product itself; that said brand identities are built after a process of exploration and analysis of market and users. We are entering the purpose economy, were we as customers are trying to find more meaning through every purchase/action. Brands are ideas. Brands are an inspiration. Brands drive culture. Building brand identities that matter.